GOAL GiantsCam McCarthy scores a goal from a Turnover. GOAL SunsTouk Miller scores a goal from a Stoppage. RUSHED BEHIND to Giants from a Turnover. BEHIND GiantsToby Greene scores a behind from a Stoppage. Gold Coast Suns InterchangeJarred Ellis was substituted for Tom J. Lynch. GOAL GiantsTomas Bugg scores a goal from a Stoppage. Gold Coast Suns InterchangeAndrew Boston was substituted for Jarred Ellis. GOAL GiantsCam McCarthy scores a goal from a Stoppage. GOAL GiantsTom Downie scores a goal from a Turnover. 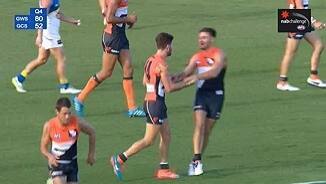 GWS Giants InterchangeCam McCarthy was substituted for Jacob Townsend. GOAL GiantsRyan Griffen scores a goal from a Turnover. GOAL SunsHarley Bennell scores a goal from a Stoppage. 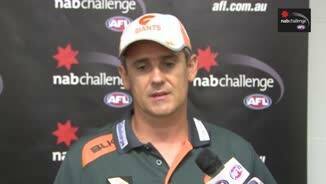 GWS Giants InterchangeAndrew Phillips was changed with Will Hoskin-Elliott due to an injury. 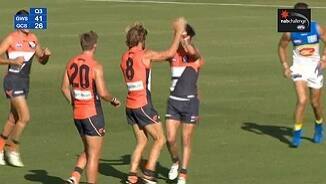 GWS Giants InterchangeAdam Kennedy was changed with Matt Buntine due to an injury. BEHIND GiantsWill Hoskin-Elliott scores a behind from a Turnover. BEHIND GiantsAdam Tomlinson scores a behind from a Turnover. GOAL GiantsZac Williams scores a goal from a Turnover. 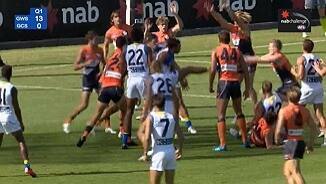 RUSHED BEHIND to Giants from a Stoppage. 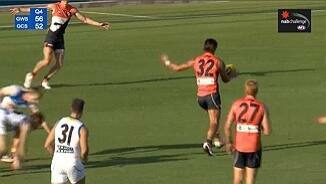 GWS Giants InterchangeJack Steele was substituted for Nathan Wilson. 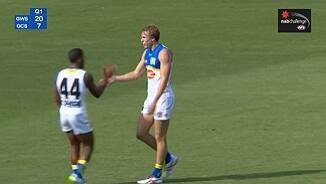 Gold Coast Suns InterchangeJarred Ellis was substituted for Andrew Boston. 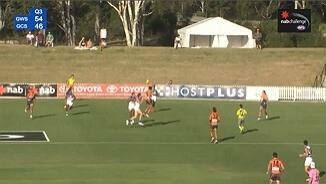 Gold Coast Suns InterchangeSeb Tape was changed with Andrew Boston due to an injury. 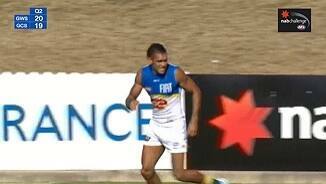 BEHIND SunsHarley Bennell scores a behind from a Stoppage. SUPERGOAL SunsTrent McKenzie scores a supergoal from a Turnover. RUSHED BEHIND to Suns from a Turnover. SUPERGOAL SunsSean Lemmens scores a supergoal from a Stoppage. GOAL GiantsCallan Ward scores a goal from a Stoppage. GOAL GiantsCallan Ward scores a goal from a Turnover. Gold Coast Suns InterchangeJarred Ellis was substituted for Tom Nicholls. GOAL GiantsNick Haynes scores a goal from a Turnover. BEHIND GiantsJed Lamb scores a behind from a Turnover. GOAL GiantsWill Hoskin-Elliott scores a goal from a Kickin. Gold Coast Suns InterchangeAndrew Boston was substituted for Josh Hall. BEHIND SunsJoshua Glenn scores a behind from a Turnover. Gold Coast Suns InterchangeMatt Shaw was changed with Josh Hall due to an injury. BEHIND GiantsLachie Whitfield scores a behind from a Turnover. GOAL SunsJack Martin scores a goal from a Stoppage. 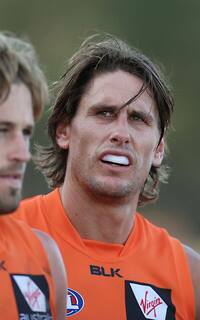 GWS Giants InterchangeAdam Kennedy was changed with Tomas Bugg due to an injury. GOAL SunsTom J. Lynch scores a goal from a Turnover. BEHIND SunsAdam Saad scores a behind from a Turnover. GOAL GiantsWill Hoskin-Elliott scores a goal from a Turnover. GOAL GiantsJeremy Cameron scores a goal from a Turnover. BEHIND GiantsRyan Griffen scores a behind from a Stoppage. GOAL GiantsDylan Shiel scores a goal from a Stoppage. Welcome to BISP for the GWS Giants v Gold Coast Suns Round 2 clash. 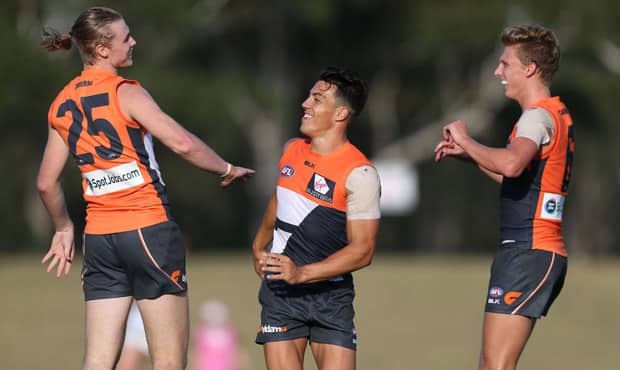 RYAN Griffen has starred in his first outing for Greater Western Sydney, amassing 31 possessions and a goal in midfield to lead the Giants to a 36-point win over Gold Coast in Blacktown. The Giants kicked the first goal of the game and owned the ball for most of the first quarter but Gold Coast hung in to create an entertaining contest. Six goals to two in the final quarter saw the Giants win 0.14.10 (94) to 2.6.4 (58). Griffen was brilliant both inside and outside the contest, able to dish the ball off with ease to bring his younger teammates into the game. He also kicked a classy goal in the final quarter to cap off a brilliant afternoon. His battle at stoppages with the Suns' David Swallow – who was also very good –was great to watch as Swallow played a lone hand for Gold Coast at centre bounces. 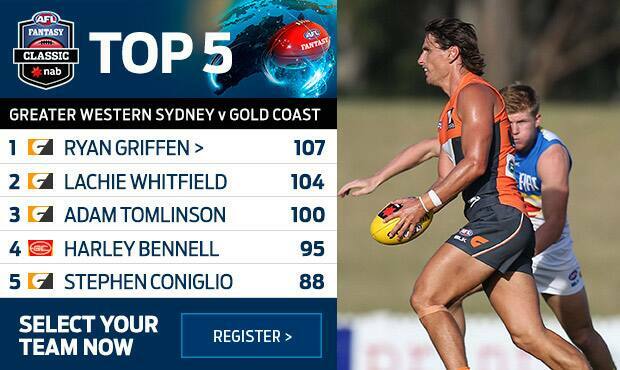 Griffen received great support from Callan Ward and Toby Greene who both hit the packs hard and constantly. Both teams had periods of ascendancy but the Giants had more avenues to attack with Jeremy Cameron a focal point up forward. His presence allowed Will Hoskin-Elliott, Ward and Dylan Shiel to find space inside 50 and kick goals. The Suns were lacking tall timber with Tom Lynch – who might come under Match Review Panel scrutiny after crashing a pack in the third quarter – battling hard up forward. His only support came from the talented Harley Bennell, who kicked three goals, winning the ball at stoppages and a cameo from Jack Martin in the second quarter. The Giants were able to take advantage of the Suns' lack of tall defenders, taking 19 marks inside 50 to the Suns' one. 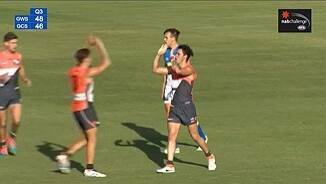 The Suns were missing key defenders Rory Thompson and Steven May. With the scores tight at three-quarter time, the Suns were expected to tire. 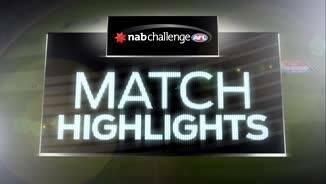 They didn't disappoint the pundits, with their pressure dropping off, and the Giants were able to take advantage, kicking six goals in the final quarter to dominate. It was an impressive effort from the Giants, topping off a good week for the club, after it signed a major co-sponsor and two key players for the future Cameron and Devon Smith. Greater Western Sydney: The Giants are going to worry more teams this season than they have before. Ryan Griffen will make a huge difference, not only winning the ball himself but also dragging attention away from talented midfielders such as Callan Ward and Dylan Shiel. Having secured Jeremy Cameron for five years, the Giants have a focal point they can build their future around and he looks set to deliver. He is injury-free again after a difficult 2014 and looks to be playing with renewed hunger, although his touch is still a little rusty. He needs support and with three late goals, Cam McCarthy made a claim for that role. Gold Coast: The Suns faced a tough task with a six-day break between games and the toll showed late in the game when the Giants put their foot on the accelerator. They were obviously missing Gary Ablett in the centre and did not have their defensive spine with Rory Thompson and Steven May both missing. The Suns were reasonable for three quarters, showing some resilience to hang in for as long as they did. 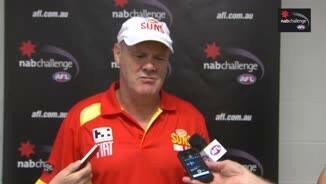 The game held plenty of lessons but not many concerns for the Suns. 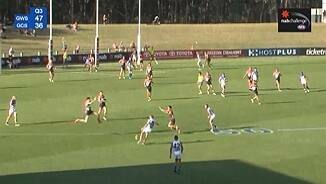 Greater Western Sydney: Griffen announced himself in the first five minutes when he slid in front of Gold Coast's Jarrod Garlett and won possession for the Giants when the ball looked lost. His bigger body stands out next to his younger teammates and he will add some muscle at the stoppages. He had 10 disposals by quarter-time, but he is still playing within himself at this stage of the year. Joel Patfull could be as important, able to take intercept marks and quell the opposition's most dangerous forward. His ability to organise the defence will be just as important as he will have a positive influence on the less experienced defenders around him. Gold Coast: If Nick Malceski can instill in Gold Coast's defence some of the steeliness evident in the Sydney Swans then he will realise his full value at his new club. He and Jarrod Harbrow are the experienced left-footers in a defence that includes the emerging Kade Kolodjashnij and Adam Saad. Malceski was serviceable without being brilliant but his presence would have comforted Saad – who was playing just his second game for the club – and Kolodjashnij. Saad's pace is evident and a one-handed mark in the third quarter showed he has some tricks. Tall rookie Keegan Brooksby looked raw playing as a key forward but he did enough nice things to show he is worth persisting with while Touk Miller's pressure up forward will put him in calculations for round one. Gold Coast: Andrew Boston replaced Josh Hall at half time, Jarred Ellis replaced Tom Lynch at three quarter time.